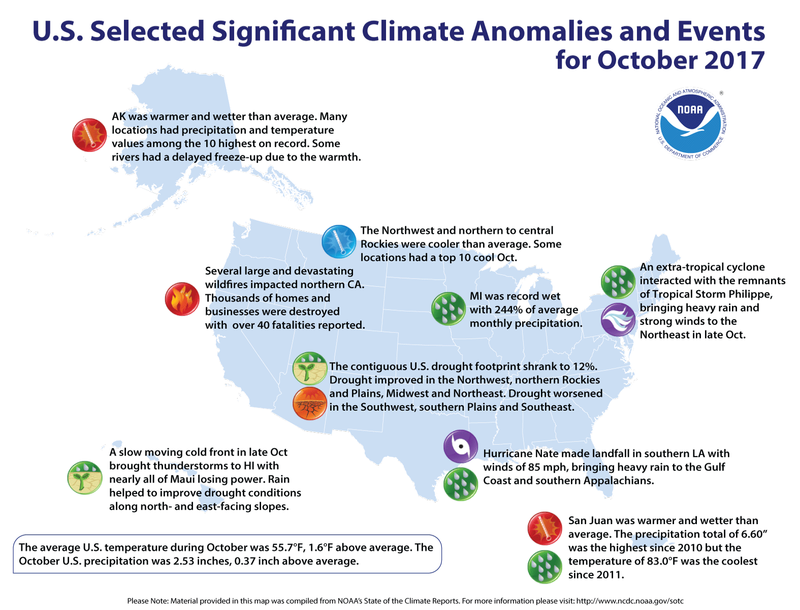 The October nationally averaged temperature was 55.7°F, 1.6°F above the 20th century average, and ranked among the warmest third of the historical record. Record warmth spanned New England with much-above-average temperatures stretching into the Great Lakes and Mid-Atlantic. Below-average temperatures were observed in the Northwest and northern Rockies. The year-to-date U.S. average temperature was the third warmest on record at 57.5°F, 2.5°F above average. Only January–October of 2012 and 2016 were warmer. 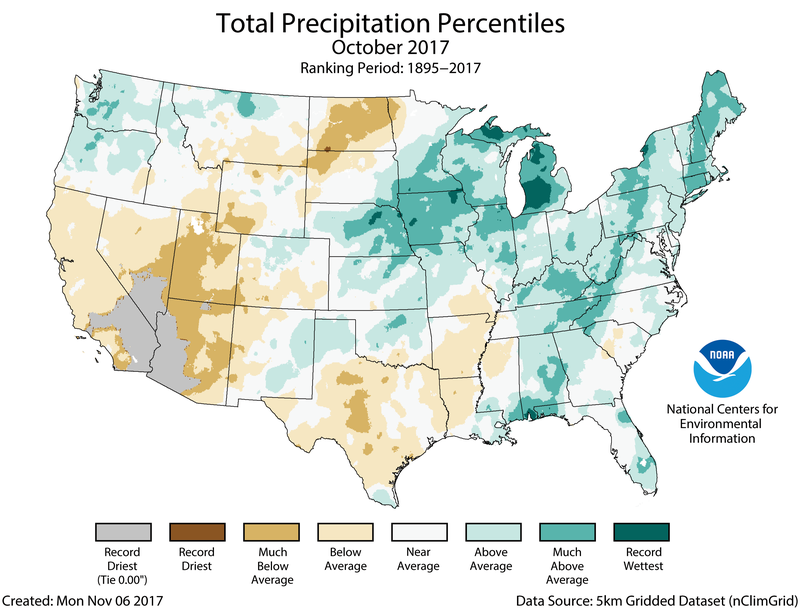 For October, the national precipitation total was 2.53 inches, 0.37 inch above average, and ranked among the wettest third of the historical record. Much-above-average precipitation fell in the central Plains, Midwest, Northeast, along the Appalachians, and the central Gulf Coast. Much-below-average precipitation was observed in the Southwest and parts of the northern and southern Plains. The year-to-date U.S. precipitation total was 28.93 inches, 3.57 inches above average. This was the second wettest January–October on record, with only the same period in 1998 being wetter. See all October and year-to-date U.S. temperature and precipitation maps. Above-average temperatures were observed for most of the eastern U.S. and parts of the Southwest. Record and near-record warmth stretched from the Great Lakes and Mid-Atlantic into New England. 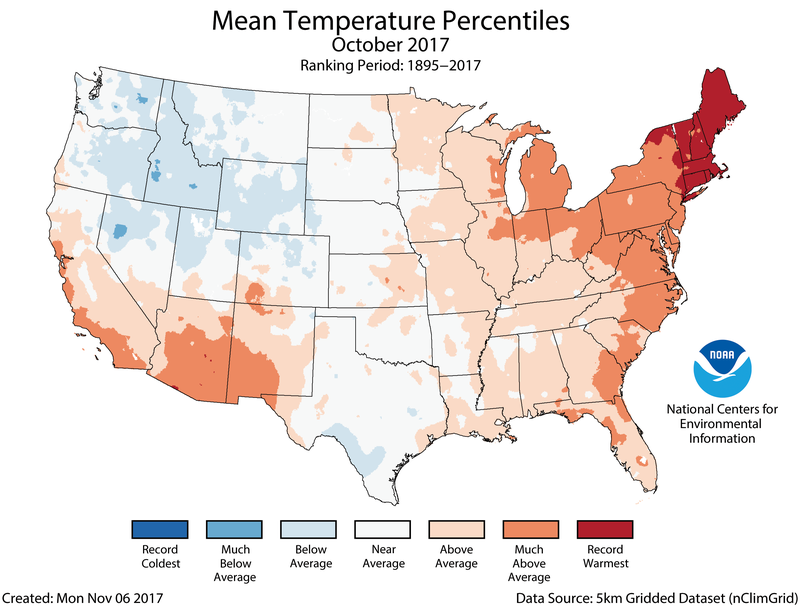 Connecticut, Maine, Massachusetts, New Hampshire, Rhode Island, and Vermont each had their warmest October on record. Below-average October temperatures were observed for parts of the Northwest stretching into the northern and central Rockies and Great Basin. Some locations in the Northwest and Great Basin had a top 10 cool October. Above-average precipitation fell across the Northwest, central Plains, Midwest, and much of the East Coast. Record and near-record precipitation was observed in parts of the Midwest, Northeast, and central Gulf Coast. Michigan had its wettest October on record with 244 percent of average monthly precipitation. According to the October 31 U.S. Drought Monitor report, 12.0 percent of the contiguous U.S. was in drought, down nearly 2.4 percent compared to the beginning of October. Drought improved across parts of the Northwest, northern Rockies to Great Plains, Midwest, and Northeast. Drought conditions expanded and intensified in parts of the Southwest, southern Plains, Lower Mississippi Valley, and Southeast. Outside of the contiguous U.S., drought conditions improved across parts of Hawaii. Two tropical cyclones impacted the contiguous U.S. during October. Hurricane Nate made landfall near the mouth of the Mississippi River as a Category 1 Hurricane with estimated winds of 85 mph on October 8. Nate brought heavy rains to the central Gulf Coast and southern Appalachians. Tropical Storm Philippe made landfall near Everglades National Park in Florida on October 29 with estimated sustained winds of 45 mph. The remnants of Philippe interacted with an extratropical cyclone off the East Coast, bringing heavy rain and hurricane-force winds to the Northeast. During the second week of October, several large and destructive wildfires devastated parts of northern California. Following a wet winter season in the region that led to a productive growing season, typical seasonal dryness during the summer and autumn dried vegetation, creating abundant wildfire fuels. A hot and windy weather pattern during October caused several wildfires to grow out of control very quickly. Thousands of homes and business were destroyed and at least 40 fatalities were reported—the deadliest week in California wildfire history, according to state officials. Every state across the contiguous U.S. had an above-average temperature for the first 10 months of the year. Thirty-nine states, stretching from coast to coast, had much-above-average temperatures for January–October. Five states in the Southwest and Southeast—Arizona, Florida, Georgia, North Carolina, and South Carolina—were record warm. Most locations had wetter than average conditions during January–October. Much-above-average precipitation was observed across the West and parts of the southern Plains, central Gulf Coast, and Great Lakes to Northeast. Nine states were much wetter than average, and Michigan was record wet. Conversely, below-average precipitation was observed across the northern Rockies to northern Plains and parts of the Southwest. North Dakota had its 10th driest year-to-date. The U.S. Climate Extremes Index (USCEI) for the year-to-date was the fourth highest value on record at nearly double the average. On the national scale, extremes in warm maximum and minimum temperatures, one-day precipitation totals, days with precipitation, and landfalling tropical cyclones contributed to the elevated USCEI. The USCEI is an index that tracks extremes (falling in the upper or lower 10 percent of the record) in temperature, precipitation, drought, and landfalling tropical cyclones across the contiguous U.S. According to the April 10 U.S. Drought Monitor, moderate to exceptional drought covers 29.7% of the contiguous U.S. According to the January 23 U.S. Drought Monitor, moderate to extreme drought covers 35.4% of the contiguous U.S. According to the July 25 U.S. Drought Monitor, moderate to extreme drought covers 11.0% of the contiguous U.S.